When writer Michelle O'Connell joined a march to commemorate soldiers who went off to fight in World War One, she was moved by how the event had a profound influence on her and her son. Through the eyes of her son, Christopher, she has produced a touching story of the commemorative march, capturing the flavor of the times and the mixed emotions of the families left behind. 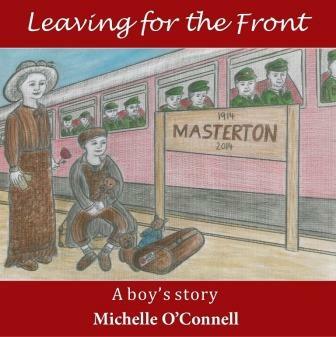 'Leaving for the Front' is a perfect way to give children an understanding of the challenges and emotions facing families as their young people go off to war. Michelle O'Connell is a writer and illustrator. Her first published book is, Leaving for The Front. Michelle grew up in Masterton, in the Wairarapa region of New Zealand. She lived in Wellington and Melbourne, but returned to her hometown to bring up her family. Michelle wrote poetry and stories when she was a child and continued to write throughout her life. She was introduced to short story writing at college. Her college English teachers gave support and encouragement for her poetry and short story writing. Michelle was lucky to grow up in a house where books were valued and the library was visited regularly. She reads everything from junior fiction to adult biographies, classical novels and contemporary literature. As a mother she is well immersed in children's books. With her passion for literature, Michelle studied English at college and went on to complete a Bachelor of Arts in English Literature and Psychology at Victoria University. Initially she focused her career on the health and disability sectors. As a second career, she returned to study Graduate Diploma in primary teaching. Teaching children to write and trying to inspire them with books kept her passion for writing alive. Michelle can't remember there being a time in her life when she didn't draw. She was pulled towards detailed illustrations in the books she read and recognised the power of the narrative told just through illustrations. She dreamed of being an illustrator one day, but kept that dream aside as she pursued study, travel and her career. Michelle is a self-taught painter and local artist who exhibits her work in the Wairarapa. As an artist she paints in oils on large canvasses. Her artist style and illustrative styles differ and are unique to her. As an illustrator she works in graphite, water colour paints and water colour pencils on paper. She has written and illustrated a second children's book. Through drawing and story writing Michelle taught herself to illustrate her work. It was a journey of experimentation to discover her own style. Her first book she illustrated and wrote took over a year to complete and was written for her son's fifth birthday. Michelle writes and draws because she has to. She can't imagine her life without, books, writing or art. And she writes for her children with the aim to pass on that passion and keep it alive in them.